Navy Wife Life: My Blankie! Although the past few days have been quiet lovely, the weather is getting colder. I mean it is December. We should expect it to get colder. No snow yet though. And apparently the most prime spot to be is under the bird cage. I guess I can't complain too much. At least Pumpkin is under the cage and not on top like I've caught him a time or two. He's not trying to get the birds. 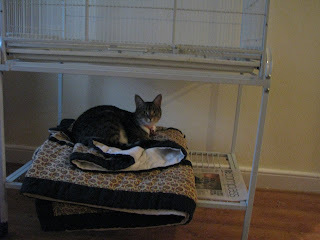 When he's on top of the cage it's normally when the birds are covered. Although he does get in quite a bit of trouble for it. Apparently this blanket that I'm using this winter is the best kitty bed ever when it's folded up. And of course monkey see, monkey do. 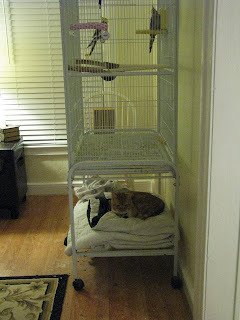 Kyla soon took up to sleeping under the bird cage once she saw Pumpkin do it. It's not like they are cold. They just seem to like the cushioning of the blanket. I guess they're just telling me that they do not have enough soft places to nap upon. The beds, couches and my lap just aren't enough. Now to see them race for the bird cage once I uncover the birds every morning.